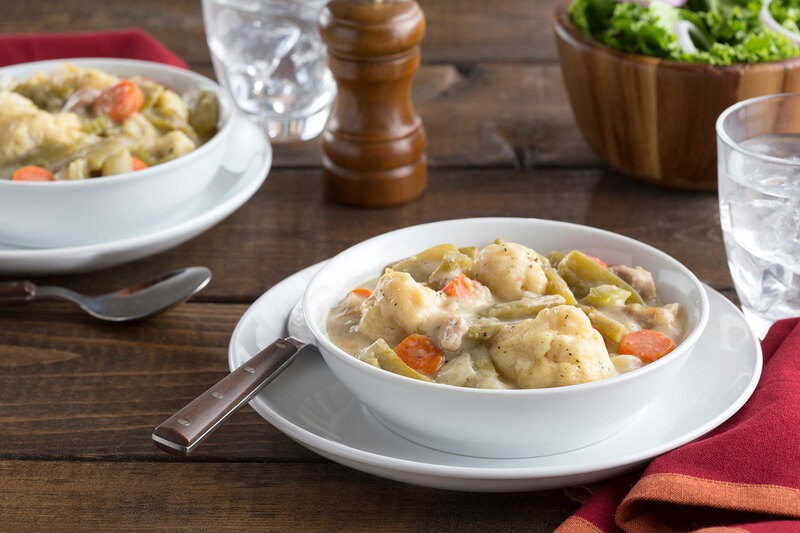 You’ll crave this one-bowl meal with Italian green beans, tender chicken and a creamy sauce topped with fluffy dumplings. Heat oil in a 5 or 6 qt. saucepan. Cook onion, celery and carrots 3 minutes over medium-high heat. Push vegetables aside and add chicken. Brown chicken 5 to 7 minutes, stirring occasionally. Meanwhile, prepare Dumpling batter. Stir together flour, baking powder and salt in a medium bowl. (If using 1 1/4 cups self-rising flour, omit baking powder and salt) Using a fork, blend in butter until mixture is crumbly. Stir in milk. Batter will be thick. Set batter aside. Sprinkle vegetables and chicken with flour and poultry seasoning. Stir until flour is completely moistened. Stir in chicken broth and milk; bring to a boil over high heat. Reduce heat and simmer, sitting constantly, until sauce is slightly thickened, about 2 minutes. Stir in green beans. Drop dumpling batter by heaping tablespoonsful over chicken and broth. Cover and simmer on medium heat 15 minutes until chicken and dumplings are cooked through.